El violinista internacional Gjorgi Dimchevski estará en el CSKG impartiendo una serie de masterclasses el día 26 de enero de 2019 en nuestra sede de la calle Santa Engracia, 181. Concertmaster of the Spanish Nacional Orchestra and the OCV Palau de Les Arts Reina Sofia in Valencia since 2007 appointed by Maestro Lorin Maazel, Gjorgi Dimchevski has established himself as a soloist, chamber musician, orchestral player and violin teacher. Born in a family of musicians, at an early age Gjorgi showed great affinity for music, and began violin lessons with his grandfather. 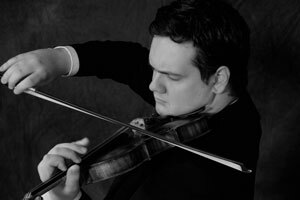 First-prize Winner of the National Violin Competition, Belgrade International Competition and Perpignan Violin Competition, he graduated from the Toulouse Conservatory with high honours in the class of prof. Blagoja Dimcevsky and the Hochschule für Misik Köln in the class of Viktor Tretyakov. As a soloist he played, age 13, Wieniawsky’s Violin Concerto Nr.1 with the Macedonian Philharmonic Orchestra, as well as Saint-Saëns under Paul Mann, Prokofiev with the Orquesta de la Comunidad Valenciana under Omer Meir Wellber, Saint-Saëns with the Klassische Philharmonie Bonn under Heribert Beissel in Cologne, Bonn and Hamburg among others. As a Concertmaster he performed extensively with the Palau de Les Arts Orchestra under Gianandrea Noseda, Lorin Maazel, Zubin Mehta, Vladimir Jurowski, Georges Prêtre, Valery Gergiev, Placido Domingo and Riccardo Chailly, with the Orquesta Sinfonica de Castilla y Leon under Vasily Petrenko and Semion Bychkov and the Spanish Nacional Orchestra under David Afkham. Since 2011 Dimchevski plays as a guest Concertmaster with the Israel Philharmonic Orchestra by a personal petition from Zubin Mehta. Since then, he had the honour of joining the IPO on Europe, South America and North America tours. During the 17/18 season he’ll be joining the Israel Philharmonic for their Japan/China tour under Maestro Mehta. Gjorgi’s devotion to chamber music has led him to perform at the most prestigious festivals such as Schleswig-Holstein Music Festival, Ohrid Summer Festival, Aix-en-Provence Festival and the Chamber Music Series of the University of Chicago with cellist Ken Olsen and pianist Simon Trp?eski. 2015 he was appointed Violin Professor for the Master’s Program in Musical Interpretation of the Valencia International University. Gjorgi appears as special guest at Placido Domingo’s latest CD “Encanto del Mar” Mediterranean Songs. He plays a “Angelo de Rub” violin from Rome 1750.